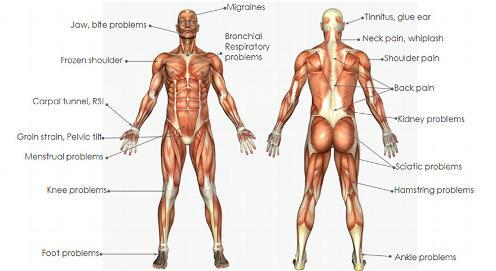 Listed above in the diagram are many ailments that Bowen responds well to , however Bowen is considered to respond well to almost all conditions. The Bowen technique is based on the theory that gentle moves over precise points of the body can prompt the body’s innate ability to relieve pain, restriction and imbalance without the need for deep, manipulative or forceful treatment. Bowen practitioners work holistically with their clients and expect to work alongside allopathic health professionals to support optimum health for their clients. For example, one of the most common complaints for which people seek Bowen treatment is back pain. The average number of treatments people have is three to four. There are always exceptions to any rule, and some people will need further or even on-going treatment. Painful and restricted shoulders are also a particular favourite as are neck pain, respiratory conditions and headache patterns. 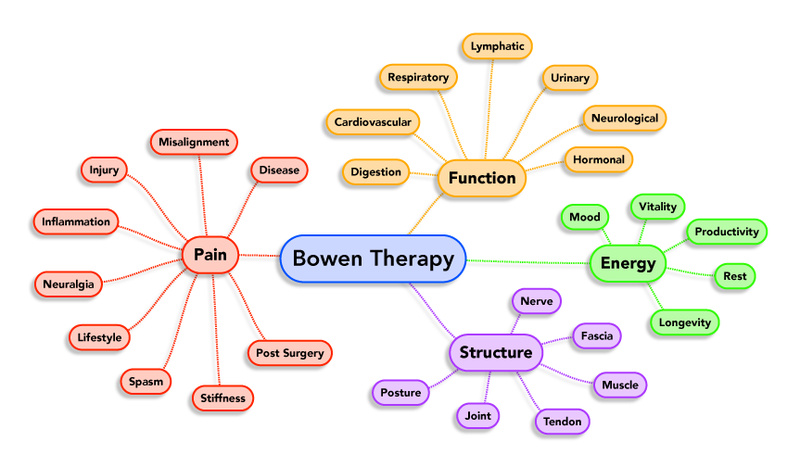 Bowen is being widely used for sports injuries as well, with rugby clubs and premiership football clubs showing interest. Not only do sportsmen report fewer injuries when treated regularly but they also notice enhanced performance. In the diagram below you can see more clearly how Bowen is working in what we consider a much more holistic way as opposed to specific conditions and therefore trating the person as whole person addressing many different layers.